* STRONG MAGNESIUM INTEGRAL WHEEL. 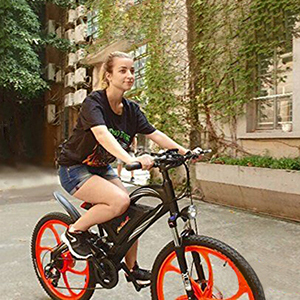 Compared with other Addmotor e-bikes,HITHOT H2 is special with its magnesium integral wheel,it is more stronger and sturdy that have much strength to support you to hit the rough road. * SPORTY MOUNTAIN BIKE FRAME DESIGN. The HITHOT H2 features a sporty,strong, curved top tube anchored at both seat post and the ends with long travel suspension. The frame and swingarm are both curved for styling, strength and clearance for the 2.1'' mountain tire; meaning the agility of the sporty bike,Addmotor HITHOT H2 is designed to ride and handle over terrain and anywhere that would give you freedom. * SUPER POWER MOTOR. With its 500 watt hub brushless motor, You can conquer many road conditions with the powerful motor. Climb uphill routes, speed up on straight roads, or traverse rough outdoor trails with ease. With pedal assistance, it can bring you up to 25 miles per hour. * DUAL SUSPENSION. 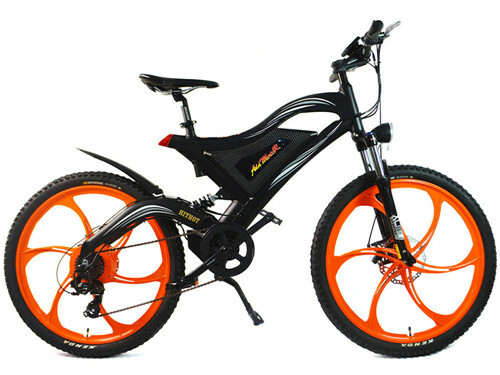 Featuring a Aluminum 100mm Travel Suspension front Fork with lockable shock and Aluminum Alloy rear Kingshock Spring Absorber,HITHOT H2 combines all comfort and pretty good appearance with the dual suspension that make a smooth travel in a rough terrain bicycling. * USE ELECTRIC POWER OR PEDAL ASSIST OR MUSCLE POWER TO MOVE ALONG. * CAN REACH UP TO 60 MILES using the level one assist at a single 4 hours charge,the charging time depends on the battery status. 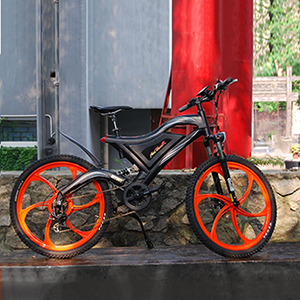 HITHOT H2 E-bike conquered the steepest hills you could find. Cool design and comfortable to ride bring more funny. Perfect for off road, trails, and city street,college or mountain. This bike is an absolute blast to ride and a total lifesaver for your mountain biking and daily commute through the city. Comfortable to ride! With cool design, magnesium Integral Wheel. So many people say "wow" when you ride it. It will be your favorite bike you have ever owned. 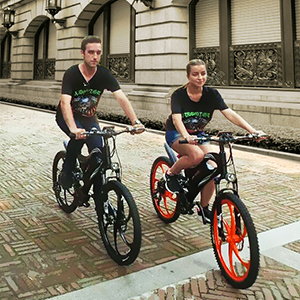 Distance: Electric Bicycle Single Charge Is 60 Miles Using The Level One Assist.